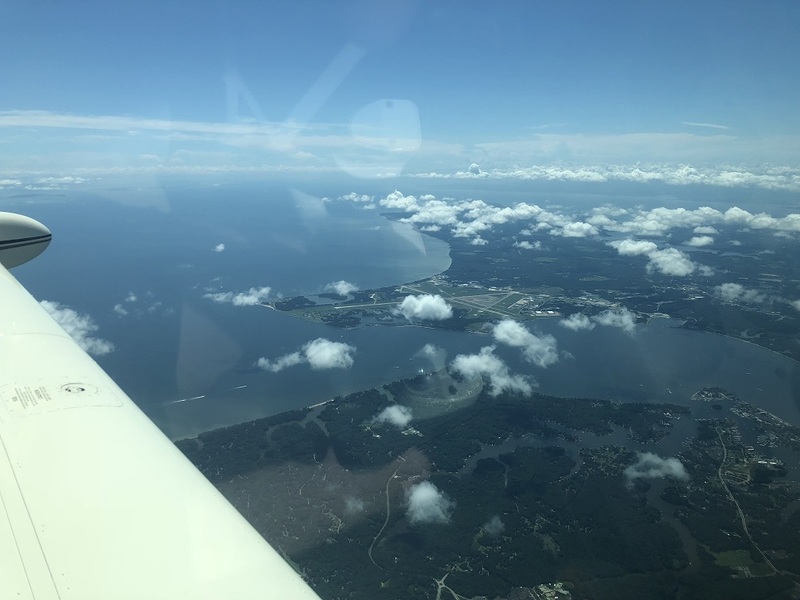 In this second installment reflecting on my first 150 days a new Bonanza owner, I am going to focus on the joy and benefit of owning this airplane. In Part One, I talked about the maintenance issues that are inevitable in any aircraft ownership experience. However, it was not meant to be a “Debbie Downer”. In fact, the entire ownership experience, including working through maintenance issues, has been nothing but exhilarating and rewarding. I feel fortunate that I was able to find an airplane within my budget that had been, for the most part, well cared for over the years. I am able to fly with my family on board and have confidence that the aircraft is not just barely airworthy, but in fine mechanical condition. Although I love flying airplanes, there is something magical about taking off and going somewhere. I think this is one of the reasons I really enjoyed being an airline pilot. I not only like airplanes, but I like what they can do for me. I have plenty of friends that are happy to just get in their airplane and fly around the pattern. That’s fine, but it is not why I bought the airplane. For me, it is time machine that allows me to go from point A to point B in less time than the airlines or in a car. This is a huge bonus for me because I am a workaholic. With all the commitments that I have, it is very difficult for me to take one or two weeks off and take a family vacation. On the other hand, two- to three-day getaways are quite easy to organize, particularly if they can be done spontaneously. The airplane affords me this luxury and results in me spending more time with my family doing meaningful things together with them. And that is what this second installment, reflecting on my first 150 days of aircraft ownership, is all about. My wife is a nervous flyer. Despite this, she has put up with my aviation obsession for over 20 years. In fact, as a show of support, she rode in the jumpseat the night that I took my aircraft type ride in the CRJ! So, for the first family outing in the new airplane, I decided we should not venture too far. A nice short flight from Allentown, PA (KABE) to Lancaster, PA (KLNS) for dinner would be just the ticket. Of course, that Sunday turned out to be one of the hottest days of the year and we were all sweating like crazy by the time I finally got airborne. A quick climb up to 4000 feet cooled us off, but the ride was bumpy and my wife was threatening to rent a car for the return back home. We had a nice dinner at Fiorentino’s as I tried to convince my wife that the ride back would be shorter and smoother. Fortunately, by the time we left Lancaster, things had cooled down a bit and the ride at 5000 feet was perfectly smooth. Overall, this first family outing was a success. This was important, as the next family trip was going to be half way across the country! Every two years the American Guild of Organists has their annual convention during the first week of July (over the 4th of July holiday). As the Vice President of Sales for Allen Organ Company, I am usually in attendance at these conventions. Carrie and I were married on the 3rd of July and she is never to keen on the idea that I am gone every other year on our anniversary. The area around the convention hotel offered a lot of attractions that I knew would be of interest to both my wife and daughter, so we decided that we would go as a family. Because my daughter is only six years old, my wife convinced me that we would need to make a few more stops that I would have preferred so that she could utilize the facilities. On Saturday, June 30th, we departed Allentown and headed for Allegheny County (KAGC) in the Pittsburgh area. We fueled, borrowed a crew car and grabbed some lunch. By the way, the people at Corporate Air are very friendly and the crew car was a brand new Ford Fusion. After our break at KAGC, we headed for Dayton, Ohio (KDAY). We decided to overnight in Dayton since the afternoon thunderstorms were starting to build. Stevens Aviation took good care of us and put the airplane in their hangar for the evening. The next morning we departed Dayton and flew to Springfield, IL (KSPI). The flight took us right over Indianapolis with a great view of the Brickyard Speedway. Upon arriving in Springfield, Stellar Aviation took good care of us and provided us with a crew car – an old Chevy Suburban with bad brakes but great air conditioning! After lunch, we departed on our final leg. We had originally planned to fly into Wheeler Downtown Airport (KMKC), but they had the runways closed for resurfacing the entire weekend. So, after looking at the fees to go into KMCI, I decided that New Century AirCenter Airport (KIXD) in Olathe, KS was the best alternative. Advanced Jet Center took great care of us and hangered the airplane for our entire stay. Over the course of the next few days, I did my convention duties and during my free time we were able to experience many of the great attractions that Kansas City has to offer. My daughter enjoyed watching the fireworks from our hotel room and my wife enjoyed the fabulous dinner that I took her to on our anniversary. We all had a great time over the next few days. The trip back was a little more stressful in that weather was a constant problem which makes my wife even more nervous. We departed Olathe, KS and almost immediately were in the clouds (and not the smooth kind) with rain pounding on the airplane. I was in my element, but I could tell Carrie was nervous. I climbed above the weather as quickly as possible and we headed for St. Louis Regional (KALN). Originally, this was just going to be a quick fuel stop, but I was racing a pretty good line of weather and we managed to land in St. Louis just minutes before the thunderstorms hit the airport. West Star Aviation took good care us, but I think initially they were a bit put off that we showed up when we did. Because of the storms coming in, they were in the process of closing up for the day and I think we were just a bit of a nuisance. They had no hangar space and I asked about tying the airplane down and the ramp agent said I could tie the airplane down if I had my own tiedowns and walked away. I didn’t have tiedowns. Miraculously, he appeared a few minutes later and tied the airplane down. I then asked about a rental car for the evening and he told me that was too much trouble and to just take the crew car. So, after only one leg, we had called it quits and were off to the hotel. The next morning, we got an early start. We departed St. Louis and headed for Fort Wayne, IN. The Fort Wayne Aero Center is a beautiful new FBO. They were extremely nice and offered us a new Minivan to go grab some breakfast. We returned, paid for a fuel and headed for Allegheny County again. By the time we arrived in Pittsburgh, my wife was not feeling to well and I took that nice Ford Fusion again and went to find some Dramamine. I have since discovered that if she takes Dramamine before we take off, she is a much happier passenger! That is now a required part of her go-bag! Finally, we were on our way back to Allentown. This trip marked the most amount of time that my family had spent with me in an airplane on a single trip. My daughter loved the entire trip. My wife tolerated the flying but, in the end, enjoyed the overall trip and the fact that we got to spend so much time together. My daughter still talks about wanting to go back to Kansas City! Shortly after acquiring the airplane, my daughter asked about going to see Darcy Lynn, a child ventriloquist that had won America’s Got Talent. We checked her tour schedule and saw that she would be in Raleigh, NC on August 5th. “Perfect!” I proclaimed to my family. Raleigh is an easy two-and-half hour flight from Allentown. And from there, its less than an hour to Myrtle Beach! My wife really liked that idea and of course my daughter loved it. The weather was perfect for our flight to Raleigh (KRDU) and against my better judgement, we went to the Signature FBO. They actually took good care of us there and the fees were not outrageous. Of course, one of the benefits of traveling via GA airplane is that at many airports they bring the rental car right out to the airplane. That was the case at Raleigh and my wife remarked about how cool that is. And when you have as much luggage as we had, it really is a great amenity. I cannot imagine dragging all that stuff through an airport terminal! We had a nice two day stay in Raleigh and then it was off to Myrtle Beach (KMYR). On the arrival into Myrtle Beach, we flew right by the DoubleTree Resort where we would be staying. The weather was perfect and we all had a great time. On our trip back to Allentown, we decided to stop in Newport News, VA (KPHF) for a quick break. In fact, our stop was so quick that this was the first time that I had to do a hot start since buying the airplane. I fussed with the throttle, mixture and fuel pump trying every technique I had read about and eventually got the big Continental going, but not before some frustration started to set in. We made it home and by this point, my wife was beginning to believe that the airplane really was of some value to the family. This trip would likely not have been possible at all had we driven. There just would not have been enough time. Several weeks later, we were scheduled to fly to Chicago. I had a business meeting and we had planned on spending a couple of extra days there showing my daughter the city. Unfortunately, the weather was not conducive to a passenger-friendly flight, so I bagged it and we drove instead. It was a 12-hour drive each way. That was the best thing that could have happened. At the end of that trip, both my wife and daughter were wishing we could have flown! Mission accomplished! The bottom line is that in the short period of time that I have owned the airplane, it has given my family and I opportunities to travel and be together that might otherwise not have been possible. These are only two examples that I have shared, but there are others as well. I also know that my daughter remembers the trips we have taken together in the airplane and that she will have those memories for the rest of her life. Airplane ownership is an expensive endeavor, but time with the family is priceless. And the Bonanza… well, it puts a smile on my face every time the hangar door goes up! It is such a well designed and refined flying machine. I can’t imagine owning anything else!